7 Replies Latest reply on Aug 7, 2012 2:04 PM by Steven Hawkins Branched from an earlier discussion. I am trying to invoke a Rest service using teiid designer. I was just going through the reference(https://access.redhat.com/knowledge/techbriefs/consume-rest-based-web-service-relational-model) u mentioned, but unfortunately it was saying u should have redhat subscription to access the files. Can you help me know how Can I invoke the rest service. You need to follow same instrunctions as defined here https://community.jboss.org/wiki/ConsumingWebServicesAsADatasourceInTeiidDesignerJustGotWAYEasier for WSDL. The difference would be on the very first step to import the WSDL, you would use "File Source (XML) >> Source and View Model"
Then create a connection profile based on URL for your REST Service. 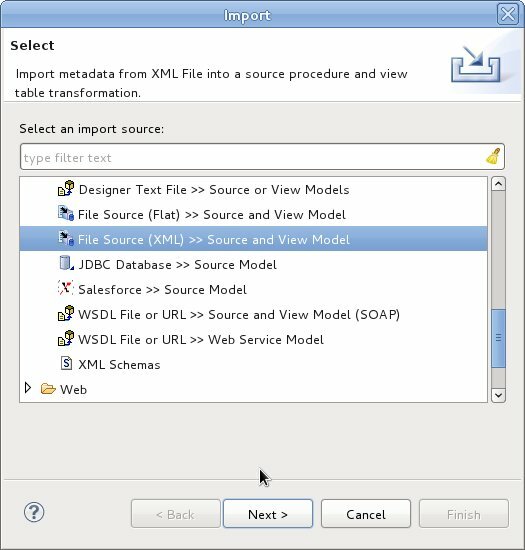 Once you establish the connection semantics, the Designer wizard can help you create read the xml contents into tabular form. 2012-07-26 10:17:13,538 INFO [org.apache.cxf.configuration.spring.ConfigurerImpl] (Worker12_QueryProcessorQueue34) Could not determine bean name for instance of class org.apache.cxf.jaxws.DispatchImpl. Due to which I am getting the empty output always. Could you help me out with this..?? If you are working with 8.x Teiid the CXF libraries are already installed in Server. However since Designer is not yet upgraded to support 8.x Teiid I am not sure if the generated WAR is fully configured for 8.x deployment, I would need to verify. Error is occuring while previewing the data. Yes, I have installed the CXF, but still not getting the output from the web service. In the logs it is always saying, "Could not determine bean name for instance of class org.apache.cxf.jaxws.DispatchImpl." If anything is going wrong could you please brief me with the steps required to cleanly run the web service starting from configuring, as this can help me know where I am going wrong as well(if u don't mind). Can you check the server log and see any exception there? 1. While I was trying to consume the SOAP based web services (ref - https://community.jboss.org/people/jdoyle/blog/2010/10/15/modeling-soap-services-with-teiid-designer--part-ii),I am getting the data but is returning as NULL and when I debugged my web method(which is just a add function getting i as param and returning 2*i as output) using syso, I am always getting input param as 0 whatever I supplied the input param. 2. While I was trying to consume the REST based web services(ref - attached pdf above),I am getting some Message Transmit error and the logs are attached (logs.txt). One more question, the pdf i have attached for running the REST based web services and the link for generatinf SOAP based service, is the steps given there are okay or that were missing some steps? 1) Where are you seeing NULL? 2) The logs show that you are still using JBoss webservices. That is not expected if CXF is installed properly. The error could be due to JBoss webserives limitation. You may want to refer specific questions about the pdf over to the designer folks. It will likely also need updated for Designer 7.8.